Canadian Online Mattress-in-a-Box Brand Endy to Go Brick-and-Mortar with 1st Storefront: Toronto-based Endy, which is Canada’s top-selling mattress-in-a-box brand, will open its first-ever immersive retail experience and showroom space, called The Endy Lodge, at Stackt Marketplace in downtown Toronto in early April. The Endy Lodge will remain open until the end of November 2019, and will act as the brand’s official Endy showroom in the city. The company says that the Endy Lounge will offer visitors “a unique, experiential space to test out the Endy assortment” in an effort to educate shoppers about Endy mattresses. Stackt Marketplace opens next month on an empty plot of land near Fort York and Bathurst, which will be transformed into a market that will feature bars, restaurants, and shops made entirely out of shipping containers. Canada’s top-selling mattress retailer Sleep Country Canada acquired Endy earlier this year in a landmark $89-million deal. West Elm to Relocate Midtown Toronto Showroom in the ‘Art Shoppe Lofts’: Upscale NYC-based home furnishings retailer West Elm will relocate its midtown Toronto showroom to a new 14,000 square foot retail space at 2131 Yonge Street. 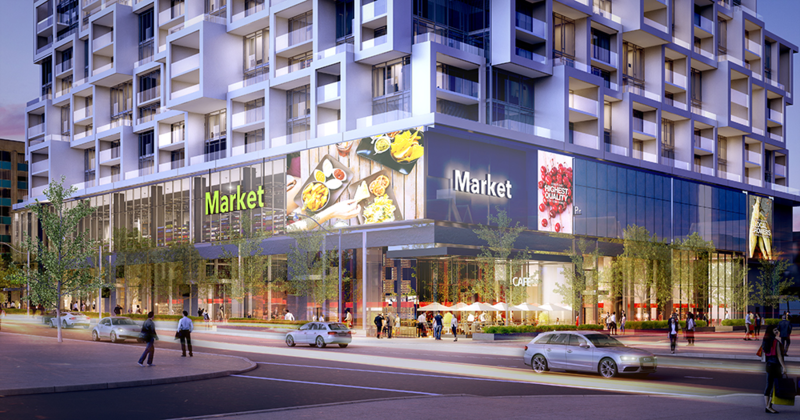 The store will be located on the ground level of the 70,000 square foot two-level retail podium at the base of the ‘Art Shoppe Lofts’ mixed-use project that is currently under construction just south of Eglinton Avenue on Yonge Street. The name ‘Art Shoppe Lofts’ references the fact that the site is the former home to the iconic Art Shoppe furniture store. The second-floor space of the commercial podium has been leased to a national grocery chain (details to be released soon) which means about 90% of the available commercial square footage in the development's two floors are now spoken for. The award-winning ‘Art Shoppe Lofts’ was launched in early 2015, and it saw global headlines when it was announced that late fashion designer Karl Lagerfeld was designing the development's residential lobbies. The retail podium at the ‘Art Shoppe Lofts’ is being leased out by CBRE under the direction of the team led by Arlin Markowitz, Alex Edmison, Jackson Turner and Selina Tao, who acted on behalf of the landlord in the West Elm lease deal. Geoff Smith of CBRE represented West Elm. Capital Developments/Freed Developments are the developers for the Art Shoppe Lofts, which will include a residential tower with 624 condominium units. CBRE has 9,500 square feet of retail space that is still available in the commercial podium, which may get snapped up quickly with the West Elm announcement. West Elm opened a temporary concept store in February of 2018 at 2434 Yonge Street. The two-level, 16,295 square foot retail space (which formerly housed RH/Restoration Hardware) was the sixth storefront for West Elm in Canada and its second in Toronto. West Elm also operates a large location in Toronto's Shops at King Liberty, a store at 995 Rue Wellington in Montreal, and separate West Elm and West Elm Market locations on Vancouver's tony South Granville strip. The Toronto store opened in October of 2008, Vancouver in September of 2012, and Montreal in June of 2013. Most recently, in the summer of 2015, West Elm opened at Calgary’s Mount Royal Village shopping centre. Tokyo Smoke to Open Massive Yonge Street Cannabis Storefront: Brokerage CBRE leased the former HMV space at 333 Yonge Street in downtown Toronto to cannabis-themed retailer Tokyo Smoke. The retail space will span a whopping 26,000 square feet, making it one of the largest legal cannabis retail storefronts in the world. Ontario held a ‘cannabis lottery’ earlier this year and Tokyo Smoke came to an agreement with one of the ‘winners’ to utilize the Tokyo Smoke brand for a legal storefront. The operator is Colin Campbell. Tokyo Smoke signed a 10-year lease on the space. Tokyo Smoke, which is operated by Canopy Growth Corp., operates cannabis retail stores in Manitoba and coffee shops in Toronto. The 333 Yonge Street storefront is steps north of Canada’s busiest pedestrian intersection that includes Yonge-Dundas Square and CF Toronto Eaton Centre, which is North America’s busiest shopping centre with nearly 54-million annual visitors. The area is also in close proximity to Ryerson University, research hospitals and slightly further away, City Hall and the Financial District. CBRE, under the direction of Arlin Markowitz, Jackson Turner, Alex Edmison and Teddy Taggart, acted on behalf of the landlord in the lease deal with Tokyo Smoke. Kate Camenzuli of CBRE acted on behalf of the retailer, Canopy Growth (owner of Tokyo Smoke). Other confirmed cannabis dispensary locations in downtown Toronto include a storefront at 20 Yorkville Avenue called ‘Ameri’ as well as ‘the Hunny Pot’ at 202 Queen Street West, both which will open in early April. French Fashion Brand ‘Escales’ Shutters Only North American Storefront: The Montreal location for Paris-based fashion brand Escales has shuttered its doors at 1474 Peel Street, located between Sherbrooke Street West and Ste-Catherine Street West. The boutique opened its doors in the summer of 2014. It was the first and only North American storefront for the brand, which has stores throughout France as well as in other parts of Europe, the Middle East, and Japan. The fashion brand for both men and women, inspired by boating, the sea and beach life, has been compared to Italian brand Harmont & Blaine. Escales products are often of two colours – blue and white, with its inspiration coming from “summer lifestyle as well as from winters harshness. Its designs are made in finest natural fabrics (Cashmere, Leather, Silk, Cotton or Linen). Inspired by the erosion of the pebbles, salt and sun, all dyes and treatments are natural.” Escales was founded in Paris in 2005, and prices were said to have started at about $150 in the Montreal store. At the same time, the company’s website indicates that franchise locations are available for Canadian markets including Vancouver, Whistler, Banff, Toronto, Mont-Tremblant and Quebec City. Given that the brand appears to cater to travelers, and if franchises are indeed still available, resort-like locations might work for storefronts. Escales’ products are produced in limited quantities and have a serial/ID number. The concept could therefore work as we continue to see a product ‘drop culture’ proliferate amongst successful brands, which create a sense of ‘urgency’ and ‘exclusivity’. As part of the initiative, kids/families at Blue Jays home games will have the opportunity to experience a Toys"R"Us Canada family fun zone which will feature unique, interactive family themed activities, according to the company. There will also be Toys"R"Us Canada outdoor festival activations at select games during the summer months and regular mascot appearances with Toys"R"Us Canada’s Geoffrey the Giraffe (marking his baseball debut). At a strategic level, the sponsorship also includes marketing activations for Toys "R"Us Canada that will include behind home plate signage, digital media programs, player birthday social media campaigns, game giveaways and special gift inserts for the ‘Jr. Jays Club members’. The Behar Group Opens 2nd Toronto Office: Toronto-based real estate brokerage, The Behar Group, opened their downtown Toronto office at 30 Duncan Street in the city’s entertainment district. Their new office is part of a vision Greg Evans, President, Broker of Record at The Behar Group, calls “Behar Group 2.0”. This endeavour marks the first time that The Behar Group has been put in the passenger seat as its own client. The Duncan Street space features a light and airy interior with warm, contemporary finishes. Wood floors and painted brick walls add an urban flair to the space which is furnished in a mid-century modern style. The Behar Group was established in 1992 and is actively involved in commercial, industrial, and investment real estate at every level. The real estate brokerage is often referred to as “boutique” because of their active and hands-on approach to their work. Palliser Partners with Sarah Richardson: HGTV personality and award-winning interior designer, Sarah Richardson, has teamed up with Winnipeg-based furniture manufacturer, Palliser for their first design collaboration. The collection is divided into four themes, all of which include dining, bedroom and occasional pieces as well as made-to-order upholstery. Annex: designed for the modern family; Boulevard: featuring a nod to the art deco era intended to resonate with urban travellers; Shore: evokes coastal living and is the “quintessentially Sarah”-themed collection, and Vista: highlighting bold pops of red and tangerine with geometric veneer patterning and contemporary hardware. Palliser x Sarah Richardson launches at High Point Market in April 2019 and will be made available to consumers as of Fall 2019. Click here to find your local Palliser retailer.